The shoulder joint has the greatest range of motion when compared to any other joint in the body, and this is due in part to the head of the upper arm (humeral) bone being bigger than the socket joint within the shoulder; the socket only covers about a quarter to a third of the humeral bone. This arrangement that grants great freedom of mobility comes at a sacrifice of stability in the joint. The joint relies heavily on muscles and ligaments to provide stability, therefore these soft tissue structures are susceptible to injury and degeneration. This was the first shoulder impingement injury to be recognized in literature. In this scenario, the impingement injury is found in a narrow space in the shoulder called the subacromial space. This condition is associated with the degeneration of the bicep tendons that are attached to the bicep muscles, and supraspinatus tendons that are found in the shoulder blade. It has been hypothesized that 90-95% of rotator cuff tears result from the progression of acromial impingement. This results from the entrapment of rotator cuff fibres or labrum fibres at the back of the scapula. Just to note, the labrum is a fibrocartilaginous structure found in the socket of the joint that helps to keep humeral head (which is the ball) in place. This is a relatively rare type of shoulder impingement, where entrapment occurs at the front of the scapula. It can result from the elevation of the bone in the upper arm in a backward direction combined with internal rotation. It usually manifests as pain at the front of the shoulder when lifting the arms forward, bringing them down to the side from an elevated position or internally rotating the shoulders. This is impingement of the suprascapular nerve, which is located near the socket of the joint. It’s been reported that impingement subsequently leads to degeneration and stretching of the nerve. This has been reported in volleyball players, leading to muscle wasting, decreased strength and pain in the dominant arm for about 20% of professional players. With the arm at the side of the body, and elbow fully extended, the examiner turns the elbow internally and then raises the straightened arm through full range or until complaints of pain. For this test, in the starting position the arm is first raised to 90o and the elbow bent at 90o. While supporting the elbow underneath, the arm is rotated downwards, causing the shoulder to rotate internally. It’s been reported that the Hawkin’s test appears to be more sensitive and hence is more likely to give a positive result if injury is present, but the Neer’s test appears to be more specific and can help to identify where the injury is located. Imaging is usually recommended if an impingement injury is suspected. Plain X-rays, in particular, are helpful in making a diagnosis for shoulder impingement and also making differential diagnosis for other possible conditions that are known to present similar symptoms. Stage 1 – presents with inflammation, oedema and hemorrhage at the rotator cuff tendons. This is usually seen in patients younger than 25 years and can be treated using conservative methods alone. Stage 2 – this is a continuation of stage 1, where the tendons become swollen, increasing friction and exacerbating the condition. Fibrosis and tendonitis can be present at this stage. It is usually seen in patients between the ages of 25 and 40 years. Stage 3 – in this stage, the tendons are partially or completely ruptured. Other disruptive changes can also occur to further reduce the subacromial space. This stage is usually seen in patients over 40 years old. Conservative, non-operative treatment of shoulder impingement is effective for 70-90% of patients. This may include analgesics, non-steroidal anti-inflammatory drugs (NSAIDs) and physical therapy. Corticosteroidal injections may be effective but poses a risk in damaging the rotator cuffs from multiple injections. It is therefore generally accepted that such injections be restricted to three for every 12 month period. There is little evidence to support the use of shock wave therapy and ultrasound to treat shoulder impingement. Usually, the patient is observed for 6 months to determine if treatment is effective before considering surgical options. For the athletic population where impingement is due to acute trauma or injury, however, surgery may be considered at an earlier point in time since it may allow the patient to recover faster and return to pre-injury condition. Surgery should also be the first option if there is a complete rupture of the tendons. Surgery can be done arthroscopically or it can be an open procedure3. Lazaro, R. (2005) Shoulder impingement syndromes: implications on physical therapy examination and intervention, J Jpn Phys Ther Assoc 8, 1-7. NHS. 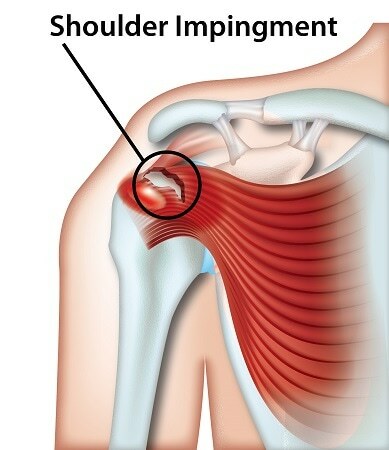 (2015) Shoulder impingement syndrome: Overview.